When you instantiate an object, a designated initializer must be executed in every class in the inheritance chain. For an example of this, check out the classes shown in Figure 1. ScientificCalculator is a subclass of Calculator, which in turn is a subclass of BusinessObject. The Golden Rule dictates that when you instantiate an instance of ScientificCalculator class, the designated initializer of each class (shown in bold) mut be executed. Figure 1 shows one possible path of initializer chaining, but regardless of the path, a designated initializer must be executed in every class in the inheritance chain. Now let's take a look at Apple's three rules and see how they are really enforcing the one Golden Rule. Designated initializers must call a designated initializer from their immediate superclass - If you skip a level of inheritance, then you break the Golden Rule because one of the designated initializers in the inheritance chain would not be called. Convenience initializers must call another initializer available in the same class - If a convenience initializer called an initializer in a different class or didn't call another initializer in the same class, the designated initializer in that class would not be executed, breaking the Golden Rule. Convenience initializers must ultimately end up calling a designated initializer - If this rule is broken, then the designated initializer in the same class as the convenience initializer would not be executed. The Translator object's initializer is executed and its properties are initialized. 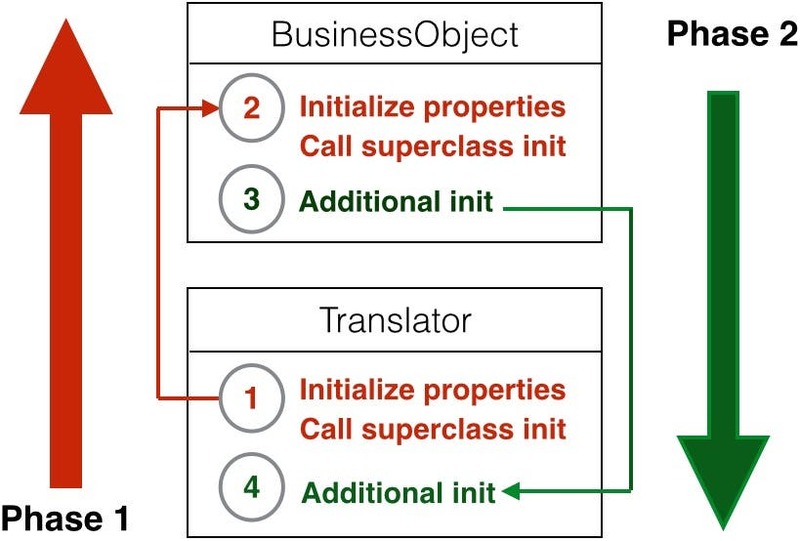 The Translator object calls up to the superclass initializer and the BusinessObject properties are initialized. The BusinessObject's initializer can optionally perform additional initialization. Execution is transferred back to the Translator object's initializer, which can optionally perform additional initialization. To help you fully understand how this two-phase initialization works, lets make the Translator class a subclass of BusinessObject and see how this affects its initialization. In the InitalizerDemo project, select the BusinessObject.swift file in the Project Navigator. 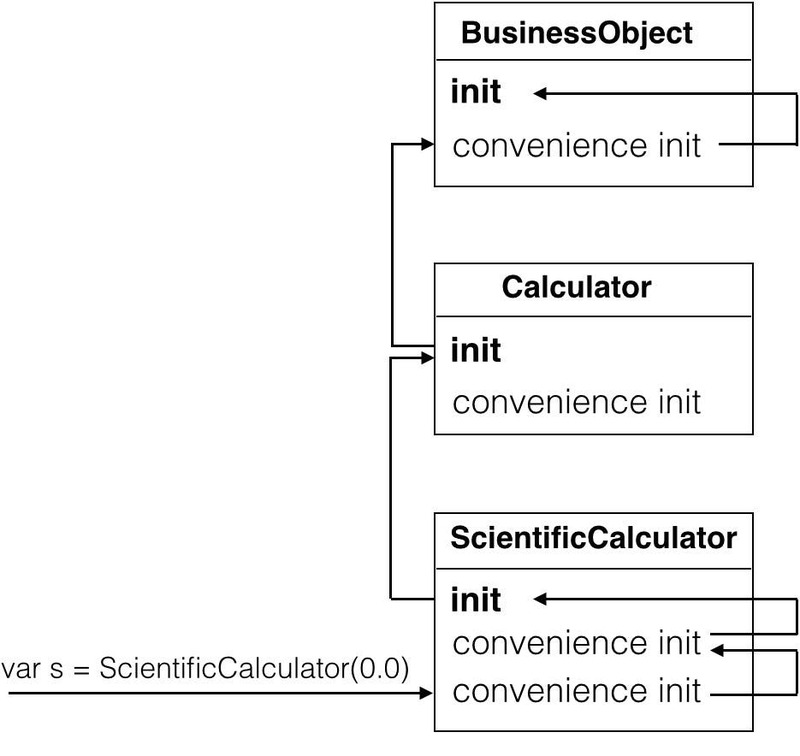 Now let's create the inheritance relationship shown in Figure 3. 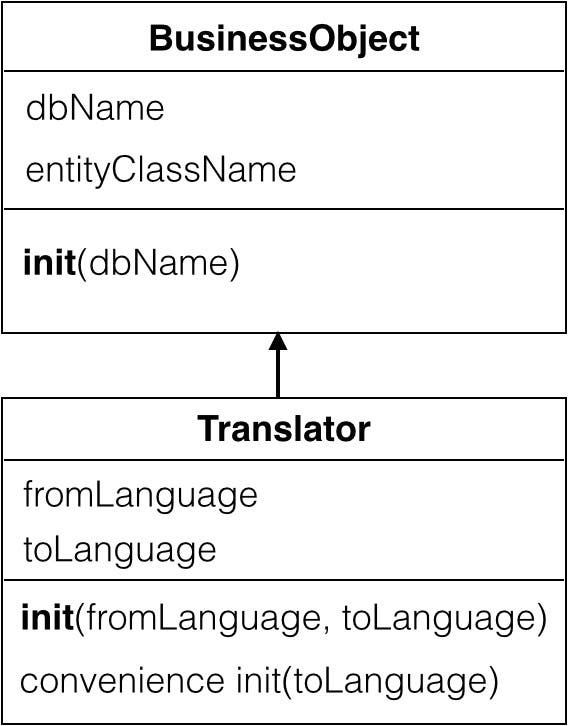 Figure 3 - BusinessObject and Translator classes. 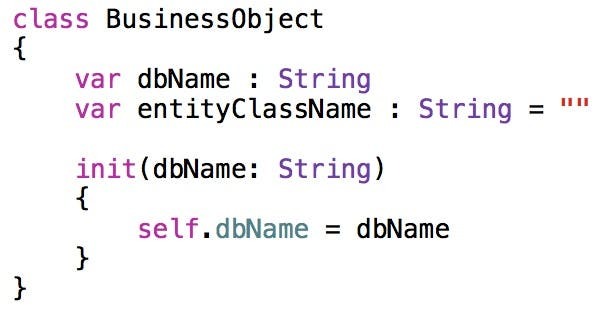 This code calls the BusinessObject class's designated initializer, passing a value for the dbName parameter. There are four basic safety checks performed by the Swift compiler to make sure Swift's two-phase initialization is set up properly in your custom classes. Let's take a look at each of these checks in the context of the Translator and BusinessObject relationship you have just set up. Safety Check 1: A designated initializer must ensure that all of the properties introduced by its class are initialized before it delegates up to a superclass initializer. The Translator class currently initializes both of its properties before it makes a call to super.init. If you comment out the code that initalizes the toLanguage property, you will see the compiler enforce Safety Check 1 as shown in Figure 4. Safety Check 2: A designated initializer must delegate up to a superclass initializer before assigning a value to an inherited property. If you add code to the Translator object's convenience initializer that sets the value of the fromLanguage property before calling the designated initializer, you will see the compiler enforce Safety Check 3 as shown in Figure 6. Safety Check 4: An initializer cannot call any instance methods, read the values of any instance properties, or refer to self as a value until after the first phase of initialization is complete. 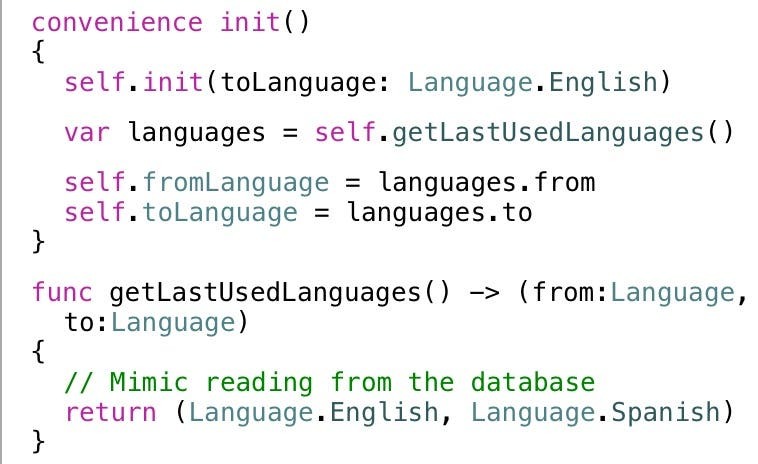 This convenience initializer first calls self.init, and then calls the getLastUsedLanguages instance method, which reads the previously used from/to langauges from a local database (we're just mimicking that here) and returns the languages in a tuple. The initializer then stores those values in the fromLanguage and toLanguage properties. If you move the call to the instance method above the call to super.init, you would see the compiler enforce Safety Check 4 as shown in Figure 7. This gives the Translator class two designated initializers (which is perfectly legal) and allows the initializer to set the values of the fromLanguage and to Language properties in phase 1 of the initialization rather than waiting for phase 2. Unlike regular methods, in Swift, initializers are only inherited by a subclass under specific conditions. Let's try a hands-on example to help you fully understand how this works. Since you are already familiar with the Translator class and its initializers, let's create a subclass of Translator to see how initializer inheritance works. Open the InheritanceDemo project in Xcode. Right-click the Translator.swift file in the Project Navigator and select New File... from the menu. On the left side of the New File dialog under the iOS section, select Source. On the right side of the dialog, select Swift File, and then click Next. In the Save File dialog, change the Name of the file to Subtranslator.swift and click the Create button. This adds the new code file to the Project Navigator. With the Subtranslator.swift file selected in the Project Navigator, go to the File Inspector (the first button on the left in the Inspector toolbar) and select the InitializerDemoTests check box. This makes the Subtranslator class accessible to the unit test target. When you type the opening parentheses to invoke the Subtranslator initializer, notice there is only initializer shown in Code Completion as shown in Figure 8. This is the default initializer provided by Swift when you don't declare any initializers for a class. Let's see what happens when we make Subtranslator a subclass of the Translator class. Press Command+B to build the project. Go back to the InitializerDemoTests.swift file and delete the parentheses in the code that creates the instance of the Subtranslator class. Afterwards, add the opening parentheses back in and you will see the list of initializer methods shown in Figure 9. Rule 1: If your subclass doesn't define any designated initializers, it automatically inherits all of its superclass initializers. We didn't declare any initializers in the Subtranslator class, so it inherited the designated initailizers from the Translator class. The third initializer in the Code Completion list shown in Figure 6.13 is a convenience initializer. 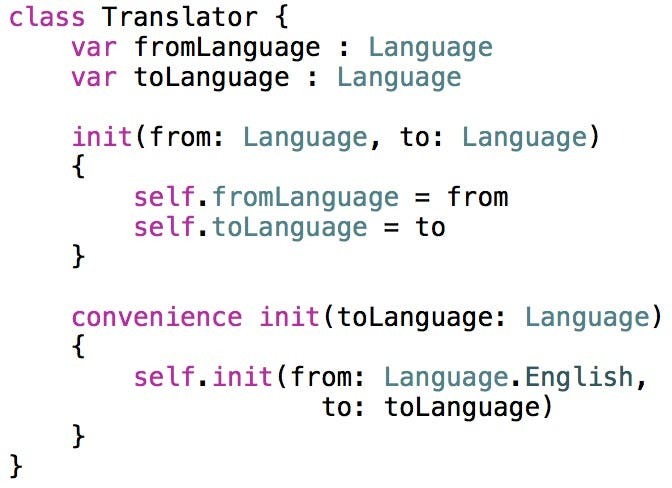 This initializer is also inherited from the Translator class because of Swift's second rule of initializer inheritance. Rule 2: If your subclass provides an implementation of all of its superclass designated initializers—either by inheriting them as per rule 1, or by providing a custom implementation as part of its definition—then it automatically inherits all of the superclass convenience initializers. The Subtranslator class inherited all of the Translator class's designated initializers, so it also inherited its convenience initializer. Now let's see what happens if we declare a designated initializer in the Subtranslator subclass. Go back to the InitializerDemoTests.swift file and delete the parentheses in the code that creates an instance of the Subtranslator class. Afterwards, add the opening parentheses back in and you will see the list of initializer methods shown in Figure 10. Figure 10 - No initializers are inherited. 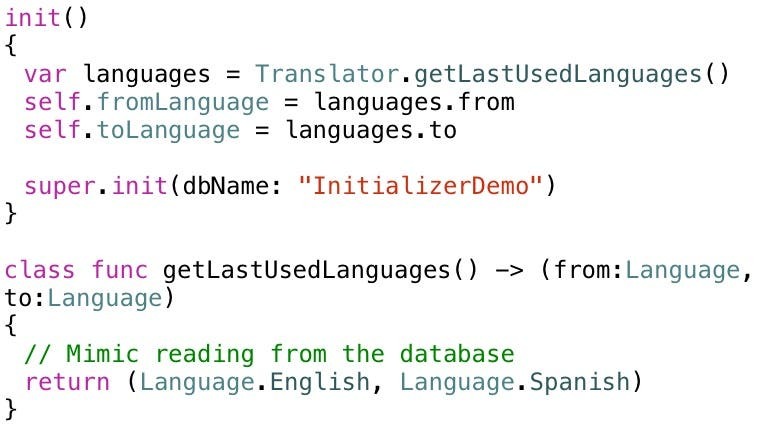 According to the rules of initializer inheritance, the Subtranslator class no longer inherits any initializers from the Translator class because it declares its own designated initializer. Let's change the Subtranslator class's designated initializer to a convenience initializer and see what happens. Now go back to the InitializerDemoTests.swift code file, delete the parentheses, add the opening parentheses back in, and you will see the list of initializers shown in Figure 11. Figure 11 - The inherited initializers are back! From this, we learn that if a subclass only declares convenience initializers, it inherits all of its superclass initializers. As with regular Swift methods, if you override an initializer from a superclass, you use the override keyword and declare an initializer with the same parameters and types. Let's give it a try. Go back to the InitializerDemoTests.swift file and check out the initializers that now appear in the Code Completion list (Figure 12). As you can see, the Subtranslator class still inherits the convenience initializers when it manually overrides the Translator class's designated initializers. Another point to note about overriding initializers, is that a class can override a designated initializer and make it a convenience initializer instead. Doing this still allows the subclass to inherit the superclass convenience initializers. Optional properties automatically receive a value during initialization. You should declare a property as optional if it's allowed to have no value during initialization or at some later point. Constant property values can be set during initialization, but they must have a definite value by the time the initialization process is complete. Constant values can only be set by the class in which they are declared. This means you can't modify the value of a constant property in a subclass. That covers most of what you need to know about initalizing your custom classes! I hope this has demystified Swift class initialization for you. I recommend reviewing the information in both parts of this post as you create initializers for your own custom classes.